The global internet is rich in commodity resources but scarce in specialized resources. We argue that a grid framework can achieve better performance if it separates the management of commodity tasks from the tasks requiring specialized resources. 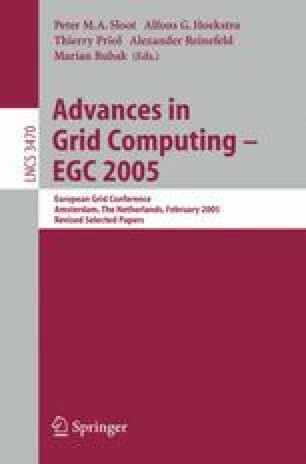 We show that the performance of task execution on a commodity grid is the delay of entering into execution. This effectively transforms the resource allocation problem into a routing problem. We present an approach in which commodity tasks are distributed to the computation service providers by the use of a forwarding mesh based on randomized Hamilton cycles. We provide stochastically weighted algorithms for forwarding. Mathematical analysis and extensive simulations demonstrate that the approach is scalable and provides efficient task allocation on networks loaded up to 95% of their capacity.